You are at:Home»Herbs»Apium graveolens Linn. Latin name : Apium graveolens Linn. Description : he seeds are alterative, diaphoretic, diuretic, emmenagogue, galactagogue, hypotensive, lithotriptic, nervine tonic, sedative, stimulant and stomachic. The seeds are rich in iron and many vitamins, including A, B, and C. Hippocrates wrote that celery could be used to calm the nerves, and indeed, its very high calcium level is likely the reason for this phenomenon. As antispasmodic they are used in bronchitis, asthma, cough, pleurisy, tuberculosis and to some extent for liver and spleen diseases. 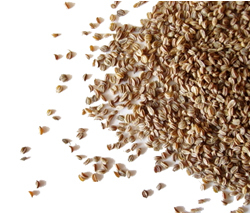 The seeds cleanse the liver and kidneys, and soften deposits. Also useful in gall bladder and kidney stone and also in arthritis, rheumatism, rheumatoid arthritis (where there is an associated mental depression) and gout helping to detoxify the body and improve circulation of blood to the muscles and joints. They help kidneys dispose of urates and other unwanted waste products, as well as working to reduce acidity in the body as a whole. Recommended for loss of appetite and bad breath. Contraindication : This herb should not be used during pregnancy as it may cause muscle contractions in the uterus and uterine bleeding. Large amounts (many times the recommended dosage) should not be taken as it may increase photosensitivity. Any strong diuretic should not be used without a doctor’s advice when acute kidney problems exist, and because it is a strong diuretic, eat foods high in potassium. Celery contains chemicals that may thin the blood and make the effects of anticoagulant medications stronger, which could increase the risk of excessive bleeding. Do not take celery seed if you also take prescription anticoagulants (“blood thinners”) such as warfarin or heparin, anti-platelet drugs such as clopidogrel, and non-steroidal anti-inflammatory drugs (NSAIDS) such as ibuprofen or naproxen. Do not take this herb without talking to your doctor first if you are taking any blood thinning medicine.